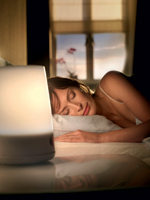 Philips have created a new type of lamp that is supposed to naturally wake you up in the morning. They are now testing the light in Longyearbyen as that place is the northernmost town in the world. The idea behind this project is to see if the Wake-up Light helps the citizens of Longyearbyen to get a better start on the day and maybe they will get more energy during the darkest months.